Do you have a reoccurring injury that simply won’t go away? Are you suffering from neck pain that makes it difficult to turn your head? Do you experience headaches or migraines on a regular basis that are getting you down? Do you have difficulty getting through your day due to lower back pain? Have you stopped playing recreational sport because chronic joint pain limits your participation? Massage therapy including deep tissue massage, trigger point therapy, and myofascial releasing techniques. Do you really know your level of Pain and Dysfunction? Take Pain & Dysfunction Questionnaire now! WHAT’S SO SPECIAL ABOUT THE BODY GENIUS PRACTITIONERS? The practitioners and team members at the Body Genius Institute see themselves as passionate leaders, educators and mentors for all of our clients and for those who chose to follow us online. We want to inspire individuals to do the things that inspire them! For some this involves overcoming pain and dysfunction and returning to the activities they enjoy such as golf, tennis, swimming or running. We see ourselves as ‘Holistic Practitioners’ because of our ability to mentor our clients and provide advice that not only helps alleviate their pain but also enhances their quality of life. For many clients this involves coaching them to remove the barriers to healing and to support the body’s natural healing processes. There is an athlete in every body! Did you know that the scientific evidence suggests that people working night shifts or with very poor sleeping habits are slower to heal? Did you know that chronic dehydration can lead to joint and muscle pain? Did you know that gut inflammation and constipation is a contributing factor in up to 70% of patients reporting to doctors for lower back pain? Did you know that unstable blood sugar levels caused by a poor diet can lead to headaches? Think positively about the healing process and reassure them that in the vast majority of cases pain resolution can be achieved. Inspire their minds with great literature and thought provoking articles. By understanding why they are in pain, clients are empowered and feel a sense of control during the healing process. What is the Pain Generator? Every client should be evaluated from a health perspective and mentored and empowered to successfully fulfill the requirements of the foundation principles of health. The BG practitioners are acutely aware that while treating clients for ‘Pain and Dysfunction’ they must also consider whether the client satisfies the baseline level – HEALTH. This approach substantially increases the likelihood of a successful outcome and for many clients it’s the ‘secret ingredient’ that allows them to overcome chronic pain and speed up the healing process. How can our Pain & Dysfunction Practitioners help? The first step in the ‘Client Journey’ is to complete the Body Genius Intake Forms. This is a critical step in the evaluation process and includes a detailed medical and health history. Our practitioners may call you to discuss your answers and to obtain more detailed information. The next step in the process is to perform a detailed Initial Assessment that evaluates your body from head to toe. Our skilled practitioners will follow a detailed checklist to ensure that nothing gets missed and an accurate diagnosis is made. The Body Genius Method has proven to be extremely successful and consistently produces superior clinical outcomes and very high customer satisfaction. √ Assessment of all the major joints of the body: Feet, ankles, knees, hips, hands, wrists, elbows, and shoulders. √ Assessment of the spinal column: Lower back (lumbar), middle back (thoracic) and neck (cervical). √ Assessment of all the major muscles of the body: Both length testing and palpation (touch) to evaluate tone and look for trigger points. √ Special tests such as assessing breathing and the functioning of the diaphragm, temporomandibular joint (TMJ) or jaw, upper cervical spine, cervical and lumbar discs, sacroiliac joints (SIJ), the fascia or connective tissues of the body, and possibly the viscera or internal organs, will be performed. What are the reasons for such a detailed and comprehensive assessment? Finding the ‘pain generator’ is such a critical component to this process. We cannot assume that just because you have left shoulder pain that the structures generating that pain lie within your shoulder. Only a detailed search will allow us to obtain an accurate diagnosis. Evaluating and treating the nervous system is a critical component in the healing process. Consider this analogy. You are at home and your Mom is in the kitchen using the blender, your Dad is in the back room vacuuming, and your brother is in the bathroom blow drying his hair. Now, you decide to plug in the toaster and toast some bread. Within seconds all of these electrical appliances shut down and stop working. What do you do? Do you begin trying to fix the toaster, blender, vacuum cleaner and hair dryer? Of course not! You find the fuse box and see if you have tripped or overloaded a circuit right? What if in this example, your neck was the hair dryer, your shoulders were the vacuum, your hips were the blender, and your knees were the toaster. That would mean your nervous system is the …? The human body needs to be considered and evaluated in a similar way. Only it’s far more complex of course. Everything we do is controlled and enabled by electrical signals running through our bodies. When we talk about the nervous system sending ‘signals’ to the brain, or synapses ‘firing,’ or the brain telling our body to walk with one foot in front of the other, what we’re talking about is electricity carrying these messages between point A and point B. And as practitioners, it’s critical that we evaluate how well the central nervous system (CNS) and peripheral nervous system (PNS) is functioning and whether dysfunction may be contributing to your pain pattern. The most exciting part is that as skilled practitioners we can ‘feel’ your nervous system and evaluate how well it’s functioning. And then go on to treat it to restore balance. This is very advanced methodology and is based upon cutting edge neuroscience. I have lower back pain, why are you assessing the functioning of my neck? Probably a better question is ‘why wouldn’t a skilled practitioner assess the entire spinal column?’ We know that in order to pick up a cup of coffee, tap a keyboard, go for a walk or even simply wiggle our toes, those messages (signals) need to be initiated in the brain. And if we follow their path they flow down the spinal cord (central nervous system) to the arms and/or legs (peripheral nervous system) to have the desired response or to evoke the desired action. So what happens when someone’s upper cervical spine is misaligned? Could this be disrupting the ‘neural flow’ along the spinal cord? Could this be contributing to dysfunction and/or pain in the lower back? If you’re watering your garden with a 30m hose, what will happen to the flow of water if there is a kink in the hose? Does it matter if this kink is close to the attachment point near the house as opposed to being halfway along the hose? Of course not, the end result is the same, a reduction in the flow of water out the end of the hose. Dysfunction at any level of the spinal column can have similar implications. Why are you assessing my lower body when I have left shoulder pain? There are several reasons that our Practitioners perform a full body screen during the initial assessment. The entire body works in synergy and in order to move in an optimal fashion we need every structure functioning at its best. The term ‘dysfunction’ may be used to describe a joint that doesn’t move through its full range of motion (ROM) or muscles/fascia that don’t have the proper tone, length or contain trigger points. Dysfunction in the lower body can have a significant impact on proper functioning in the upper body. This is even more pronounced when someone is active and participates in activities such as gardening, walking, tennis, golf, swimming, cycling or running. How would lack of movement in the left ankle affect the swing of a tennis player? Could a stiff left ankle contribute to right shoulder pain? Could a stiff ankle contribute to lower back pain? Is it possible for lower back stiffness to contribute to shoulder pain? Is it possible for jaw dysfunction to contribute to neck stiffness and pain? Could a painful right hip lead to a painful left shoulder? Is it possible for an old ankle sprain to cause reoccurring hamstring tears many years later? Is it possible for chronic middle back stiffness and poor breathing patterns to contribute to right tennis elbow pain in someone who lifts weights? The answer to all of these questions is an astounding YES! The second reason our practitioners perform a full body screen or evaluation is because noxious input to the brain can occur from any structure within the body. How these ‘unhappy’ messages are perceived by the brain will determine where the pain is felt within the body. The latest neuroscience reveals that pain is something we experience, not a ‘feeling’ in any specific part of the body. The body creates pain or other types of symptoms as a protective mechanism, or warning to let us know that something isn’t right within our body. What is most fascinating is that the brain can create this pain anywhere in the body, and often the person experiences this pain in a region of the body that is located (anatomically) away from where the dysfunction is located. And this is the reason why it’s so important for our practitioners to perform a comprehensive, full body assessment of each and every client, regardless of where their symptoms are located. Our detailed, full body, checklist ensures that we don’t miss anything and gives us the best chance of finding the ‘pain generator’ for the client’s specific symptoms or dysfunctions. One of the most powerful tools our practitioners use is the client ‘Summary Table.’ At the end of the second consultation, our practitioners will create a summary table that clearly shows your specific movement dysfunctions along with a summary of the structures that don’t ‘feel’ right within your body (palpation). This summary table acts as a template for your treatment and keeps both you and the practitioner focused on clearing movement dysfunctions, not chasing pain around the body. As stated in the previous paragraphs, pain and other symptoms can be misleading because the brain may create them in a region of the body that is located away from the source of the problem. 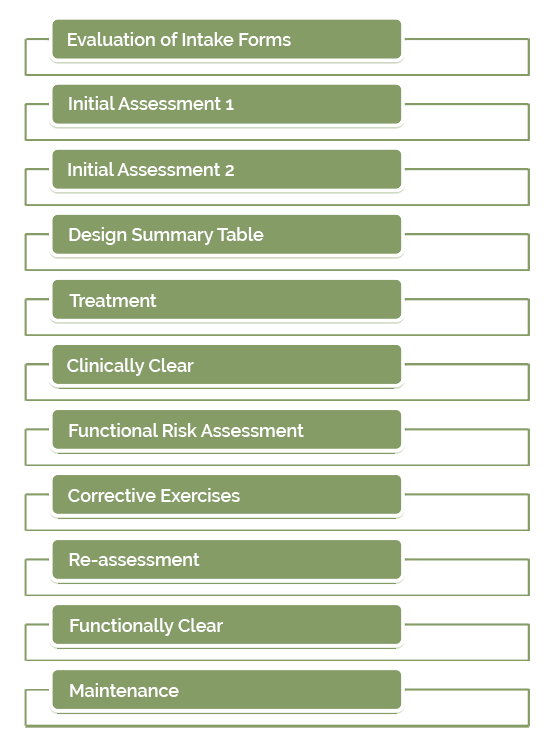 The summary table keeps both you and the practitioner focused on the ‘true’ cause of the problem. Equally exciting is that both you and the practitioner, through a process of continual re-evaluation, can clearly see that progress is being made. Session by session you will see that the number of movement dysfunctions is clearing. This can be very motivational for both you and the practitioner. Through precise testing and continual re-evaluation your Summary Table may look like this after several treatment sessions. 4 Left neck rotation = 70 deg. In the vast majority of cases, once all movement patterns are cleared, the client’s pain and other symptoms resolve. How powerful is that! Once pain has been alleviated and the client is ‘clinically clear’, the next step is to evaluate how well the client moves on a functional level. The term clinically clear means that evaluation of joint range of motion at all major joints is normal and all muscle lengths have been returned to normal. This process needs to occur regardless of whether your complaint is neck, back, shoulder, knee or ankle pain. Being pain-free and clinically clear is not enough! The last thing you want to have happen is to return to your sport or activity and re-injure yourself again, either experiencing the same pain or a new one. Despite having over 60 years of combined clinical experience, the Body Genius practitioners believe it’s not possible to determine a client’s risk of injury from clinical evaluation alone. This is why the next step in the process is to clear the client on a functional level, and this needs to be done through functional screening that is objective (measurable) and scientifically proven to assess injury risk. Our comprehensive return to activity protocol assesses your ability to perform functional movement patterns and will provide you with an individual risk profile. The Body Genius return to sport protocol is powered by the scientific backing of the Move2Perform software, which is now used throughout the world by professional teams in a wide range of sporting activities. From this information an individual risk profile is generated to determine how well your body is moving and determines your level of injury risk with exercise. This software can even compare your scores against other people of the same age, same gender, participating in the same activity or sport, at the same skill level. Every sport – golf, tennis, weightlifting, mixed martial arts, rugby, swimming, running, hockey, football, soccer, AFL, surfing, and more … are represented within the software. Allows for evidence-based programming. It’s the only system that has been validated in peer-reviewed literature. Allows for objective re-testing to clearly demonstrate that movement faults have been corrected. Current scores can be compared to previous attempts. 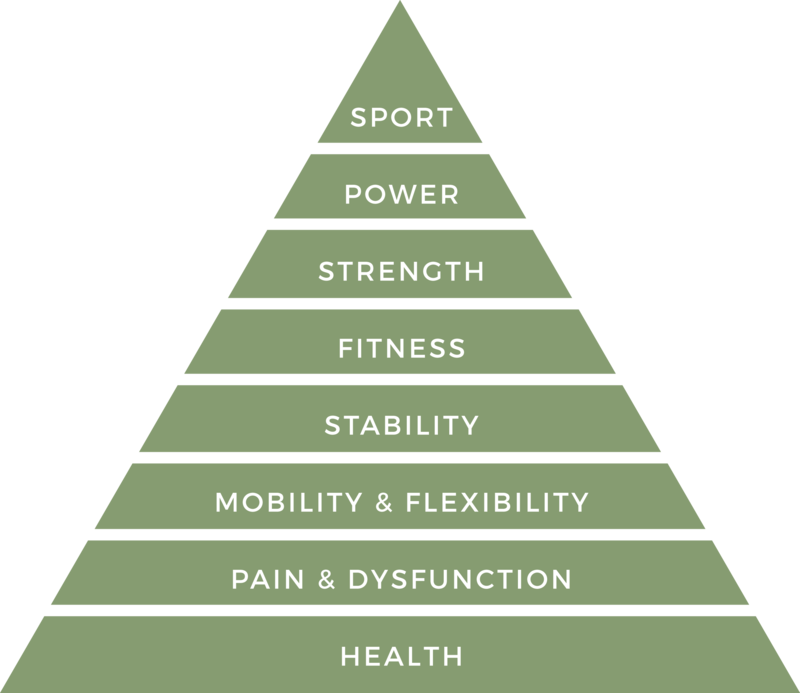 The client can now have the confidence that they have moved up the ladder from health, through pain and dysfunction, cleared mobility and flexibility, cleared stability, and have been successfully evaluated for elements of strength, power and agility. Clients can now return to their chosen activity with the confidence that their injury risk has been minimized. For some athletes, more rigorous sport-specific testing is required to clear them from a high performance point of view. 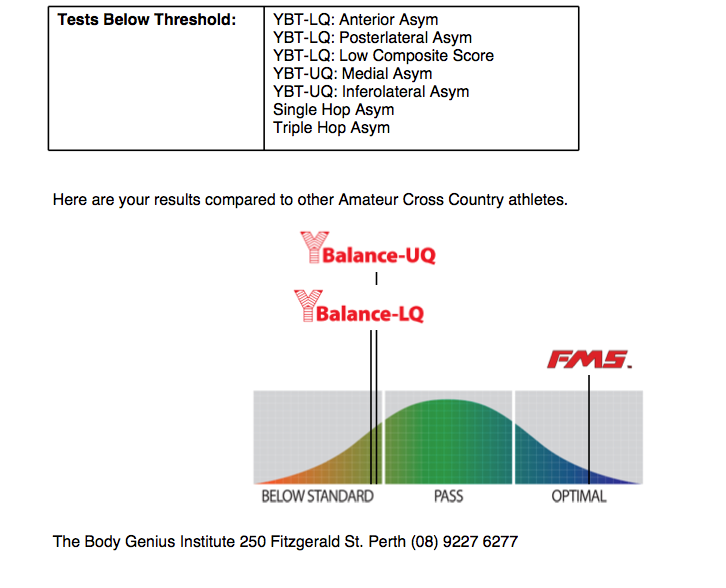 The Body Genius Institute has highly skilled Movement Coaches who can complete this testing if required. We have a proven track record of success. 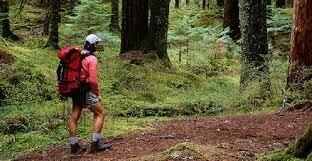 We have helped thousands of clients to overcome pain and dysfunction and make a successful return to activity. Our therapists are committed to finding the “root” cause of your problem, not just treating the symptoms. How many sessions will it take to see improvements? For instance, you may have movement restrictions in your neck rotation, shoulder rotation and hip movement. These are measureable movement patterns that can be changed and tracked with therapy. Our clinical experience has demonstrated consistently that when movement is improved and approaches a normal range, symptoms disappear at a consistent rate. One reason that this system continuously yields strong outcomes is that we are not chasing a client’s symptoms but rather relying on precise treatments that demonstrate (objective) measurable changes in movement. Both the client and the practitioner know they are on the right track. In most cases the BG Practitioners expect to see improvements within the first four sessions. This means you will see changes within your movement patterns reasonably quickly. In the majority of cases this also results in a reduction in pain or other symptoms. The BG Practitioners do not over-treat and will not continue treating you past 12 sessions unless your pain is resolving or movement dysfunction is improving. For some chronic problems, post-operative treatments, or severe injuries, treatment may persist for many months or longer. However these are unique circumstances and clients typically understand that the healing process will take longer than a few sessions. For some chronic problems, post-operative treatments, or severe injuries, treatment may persist for many months or longer. However these are unique circumstances and clients typically understand that the healing process will take longer than a few sessions. If we look to the scientific literature in relation to Chiropractic care, there are several studies that would recommend a trial period of up to 12 sessions to allow for significant change and pain reduction to be realized. Our real specialty can be found in the Body Genius Method of assessment, analysis and treatment. This cutting edge approach has proven to be extremely successful and consistently produces superior clinical outcomes and very high customer satisfaction. This step-by-step approach ensures that nothing gets missed and gives us the highest probability of achieving the client’s “Good Outcome.” We have gained a strong reputation for successful outcomes and for solving complex neuro-musculo-skeletal cases. I have seen other Physiotherapists and Chiropractors and they couldn’t solve my problem. Why do you think you can? In almost every case, our clients tell us that it’s ‘the most thorough assessment they have ever had.’ And it’s this level of detail that provides us with the answers to help solve your pain and dysfunction. The ‘pain generator’ may be dehydration, constipation, liver toxicity, food sensitivities or other gastrointestinal issues. In these cases no amount of ‘hands-on’ therapy will alleviate the pain. In some cases, poor health is preventing the tissues from healing completely. Someone with chronic tennis elbow (lateral epicondyalgia) is unlikely to heal when they are overweight, suffering from dehydration, constipated and malnourished from a processed food diet. The body simply cannot reduce inflammation at the elbow and allow it to heal when the rest of the body is chronically inflamed and toxic. The body simply cannot reduce inflammation at the elbow and allow it to heal when the rest of the body is chronically inflamed and toxic. If our practitioner feels that health challenges are contributing to your pain patterns or preventing the healing process than you may be asked to have a consultation with one of our Integrative Health Practitioners (IHP) for further evaluation. Lastly, we go one step further than most other practitioners and assess the body on a functional level. This evaluation moves well beyond gait analysis and step down tests. Our comprehensive return to sport protocol is world class and is highly predictive of injury risk. In a nutshell, many of the clients we work with simply don’t move well. The pain in their body is a signal to correct their movement patterns and to restore proper balance. And yet they have never been assessed outside of a consult room. In a nutshell, many of the clients we work with simply don’t move well. The pain in their body is a signal to correct their movement patterns and to restore proper balance. And yet they have never been assessed outside of a consult room. What happens if you cannot solve my problem? However, if things are not moving in the right direction then we have several options available to us. The Body Genius Institute has a wide range of practitioners including Integrative Health Practitioners, Chiropractors, Physiotherapists and Movement Coaches. With your permission we may choose to discuss your case with the team to gain their opinion and expertise. We can refer you for the relevant scans necessary to provide an accurate diagnosis. This may include an MRI, Ultrasound, X-ray or CT scan. The BG Team works closely with several other outstanding health professionals including sports medicine doctors, naturopaths, chiropractors, physiotherapists, podiatrists and other specialists. We are not afraid to ask for assistance to help you achieve the desired outcome. Are you able to share a case study that outlines this approach? Nicole was 45-year-old mother of three teenaged children and the principal dance teacher and choreographer at Time for Dance. Nicole was in a lot of pain, literally taking Panadol and Nurofen up to four or five doses per day. She had at that time, recently injured her back (disk bulge) and had very hot and swollen knees. None of these symptoms were making it easy for her to run her dance school. In fact, she was at her wits end trying to find a solution to her issues. Nicole had tried physiotherapy, chiropractic and various doctors but all to no avail. Nicole would improve to about 70% but never back to 100%. 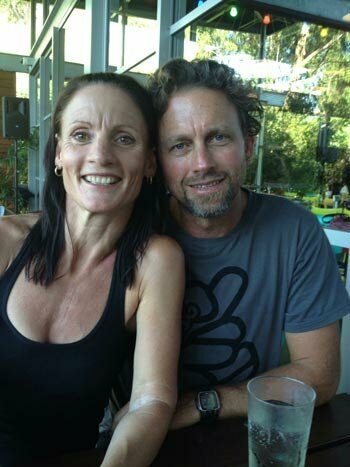 Nicole consulted with one of the Level 6 practitioners at the Body Genius Institute based on the recommendation of her husband who had visited Body Genius and had outstanding results. “The practitioner was incredibly thorough, both with his clinical assessment and his health history. He was not focused on my symptoms but rather on finding the underlying factors that were causing my pain. He investigated every aspect of my life from my dietary intake, stress levels, work load, sleep patterns, bowel habits, and even what my body craved. Physically he assessed my entire body from head to toe, it was the most thorough assessment I have ever had. Initially, I was not sure how the changes that he made to my lifestyle were going to help but quickly my pain levels reduced dramatically, I started to sleep well and stopped craving foods that my body did not need. The BG practitioner helped me with time management, allowing me to have time for myself during an extremely busy week. He changed the food that I ate, helped correct my posture and my breathing patterns. Within weeks, I was no longer taking ANY pain relief. My skin, nails and hair became healthy and strong. My digestion improved dramatically, not to mention that the inflammation within my body was completely gone. As a bonus, I also lost about 10 kilograms. Now, I am pain-free and loving life again as dance instructor. No pain, no inflammation and I have managed to keep the reduced levels of stress in my life. The Body Genius Institute is located just minutes north of the Perth’s CBD. All of our physiotherapists are based out of our Perth office, so you have easy access to the physiotherapy care you need.